Put all ingredients in a high power blender (Adam uses a vitamix) and blend until it becomes a slush. Pour into a pitcher and serve. In a small saucepan combine sugar, 1/4 c water, mint, and ginger. Bring to boiling, reduce heat and simmer 5 minutes to thicken slightly. Set aside to cool. Place watermelon, berries, and grapes in a large bowl. Add syrup mixture and toss to coat. Top with mint leaves and serve immediately. Make the dressing by whisking all of the ingredients (except the oil) in a large serving bowl, then adding the oil in a steady stream while whisking. Add the chickpeas and stir well to coat. Let it stand while you roast the carrots. Preheat the oven to 400 degrees F. On a large, rimmed baking sheet, toss the carrots, garlic, cumin, oil, and salt until well-coated. Spread evenly, then roast, shaking the pan occasionally, until tender and browned, about 25 minutes. Remove the garlic cloves from the pan and chop them into small pieces. 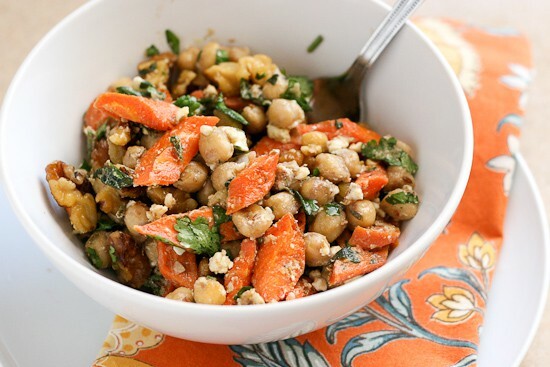 Transfer the garlic and roasted carrots to the bowl with the chickpeas. Toss until well mixed. Cool slightly, then toss in the walnuts, feta, cilantro, and mint. Season to taste with salt, if necessary. Serve warm or at room temperature. Combine chicken, oil, lime juice, and garlic in a bowl. Refrigerate for 30 minutes. Preheat a grill or grill pan to high. Grill chicken until cooked through, about 4 minutes per side. Combine greens, mint, and radishes. Sprinkle with salt, season with pepper, and drizzle with oil and lime juice. Serve with chicken and lime wedges. In a large pitcher, stir together the lime juice and sugar until dissolved. Stir in mint sprigs, and mash with a wooden spoon to release some of the oils. Pour in water, and mix well. Mix in jalapeno slices. Put a lid on the pitcher, and refrigerate 8 hours, or overnight. Combine ingredients in food processor and barely pulse or chop everything by hand and mix. Refrigerate for at least 1 hour before serving. In a one gallon sealable plastic bag, mix together all ingredients except chicken. Add chicken breats, close bag and place in a bowl. Put bowl in fridge, & let chicken marinate overnight. Remove chicken from marinade – discard marinade. Lightly oil the grill. Preheat the grill to Med Hot heat. place chicken on grill. Once it sears and browns on one side, turn over and lower heat. Don’t let the chicken burn – turn often or as needed. Total cooking time is about 20-25 min. Serve with a side salad, grilled flat bread & hummus. In a large salad bowl, combine all of the ingredients except the vinaigrette and toss thoroughly. Drizzle the vinaigrette over and toss to coat the vegetables thoroughly. I know this one sounds weird but it was really liked at the open house. Try it I think you will like it. It’s sweet, salty, & delicious. Cut rind from the watermelon, then chop the fruit into 1/2 inch chunks. Place watermelon in a large salad bowl. Pour lime juice on watermelon, and add the feta & chopped mint. Toss gently to coat. Refrigerate for 1/2 hour before serving. In a teapot or large measuring cup, combine agave nectar, mint, and lemon zest. Top with 4 cups boiling water and stir to combine. Steep for 5 minutes and strain. I like to use a French Press to make my herbal teas. You can find them at most home goods stores or on amazon.com for under $25. #3 Make a frozen granita by increasing the agave nectar to 1/4 cup, then straining the finished tea, adding 1/4 cup chopped mint, and freezing in a shallow dish. Once it begins to freeze (about 2 hours), scrape it with a fork every 15 minutes until it’s completely frozen and crystallized flakes have formed, about 2 more hours.